Do I feel Lucky? Well, do I? That would be a definite yes. I've been thinking about casting on for this project for many, many moons, but was nervous because my gauge swatch was off. But then I got a little inspiration from Tara who, like the mad and productive knitter she appears to be, is finishing hers off. 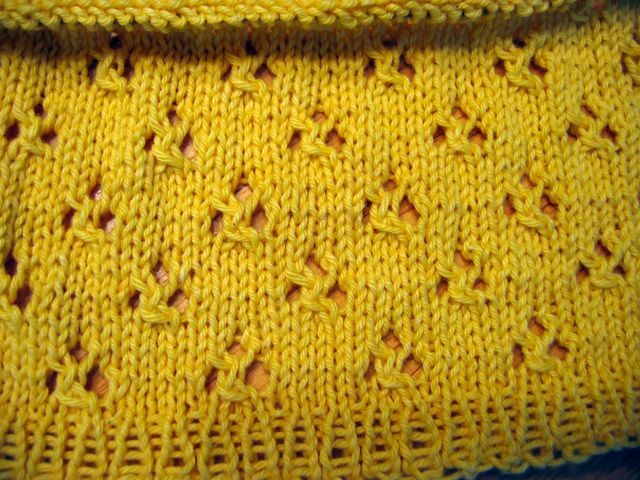 So, I took a deep breath, pulled out my next bigger needles (US#3's) and grabbed my pretty yellow Fortissima cotton. The color isn't bad in this photo, but it's not spot on, either. And you can't tell how soft this little section of sleeve is or how freakin' adorable the little cloverleaf laces are. I. Love. This. Pattern. In other lace knitting news, I've made it through about 22 repeats of Branching Out, and I'm a lot happier with it. (And I've finally joined the BO KAL). It took sitting for a couple of hours in a distraction free zone (my living room before the cat and the hubby were up) to finally get the pattern. So I'm cool with it now. Plus, it's a better pattern to take camping (yup, we're going again this weekend) than Lucky because the yarn is a heckuva lot darker and less likely to show dirt. I have to triple wash my hands before I go anywhere near Lucky. What I really need to do is start a color work project. 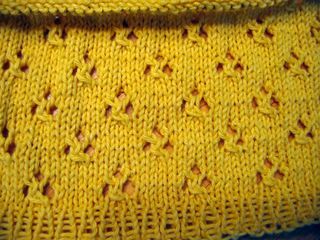 Once, I knit two little stars on a sweater that turned out to be ill-fitting. And, of course, I've striped. But that's as fancy as I've gotten. I'm really nervous and scared about jumping into intarsia/fair isle, but I think the time is nie. Once the summer of lace is over, shouldn't it be "Fall of Fair Isle"? Anyone with me? Anyone got any advice? Anyone want to hold my hand? Wish I could offer some advice about fair isle, but thus far, i've been too big of a wus to try it myself!